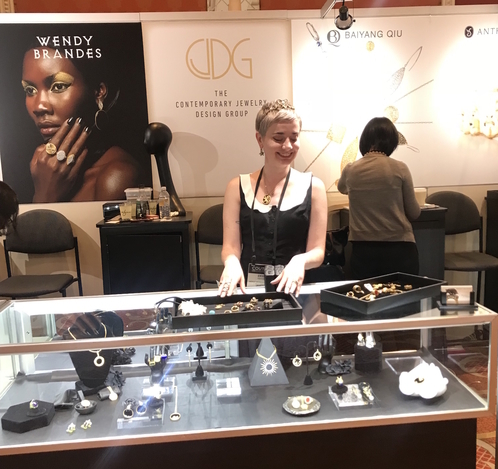 My right-hand woman Eryn and I just wrapped up our first appearance at the five-day Couture jewelry show in Las Vegas. 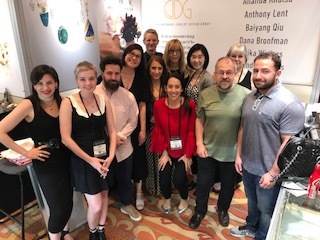 We were part of Salon 137, the Contemporary Jewelry Design Group booth, with five other fabulous fine-jewelry brands: Ananda Khalsa, Anthony Lent, Baiyang Qiu, Dana Bronfman, and my longtime jewelry-biz friend Erika Winters. I’m going to miss seeing these folks every day! We were all so busy meeting with stores and press that I didn’t get to peruse the other jewelry as much as I would have liked, but I managed to sneak in some quality time with Anthony Lent’s work. 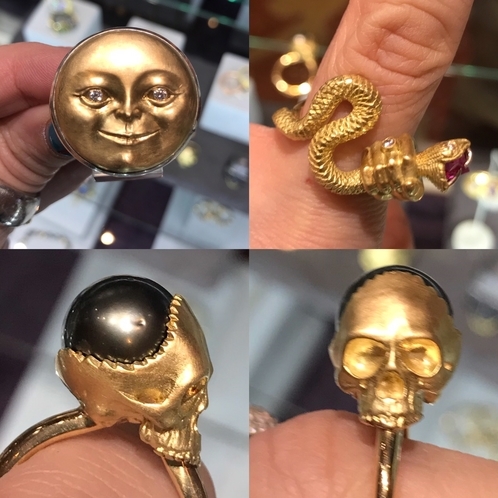 Anthony’s “man in the moon” ring (upper left) is famous. Eryn and I spent our time talking to booth visitors about our groundbreaking Concierge program for retailers. To be honest, Eryn did a lot more talking than I did because she’s the sales genius. I’m just there to shake hands, answer questions about designs, and take over the case long enough for Eryn to eat lunch. Her eyes may be cast down modestly, but if you look closely, you can see Eryn is wearing a solid-gold tiara. It was great to have an in-person meeting with the people from Alexanders Jewelers of Columbus, Ohio — Alex Khvalsky, Yelena Ashkinazi, and Shane Hampton. 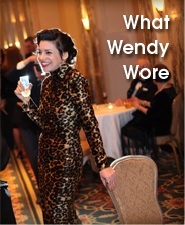 Alexanders signed on as a Concierge partner when Shane spotted my designs on the Couture website. Me and Shane. Click for the Alexanders Jewelers Instagram account. Before we even got to Vegas, Shane had requested and sold my one-of-a-kind Vampire Diana heart ring. 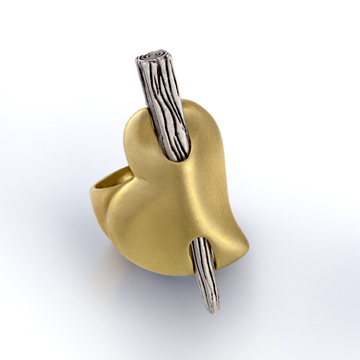 Click for a video showing how the silver stake pulls out of the 18K gold heart. The Concierge program is a new way of working with retailers who are committed to exceptional customer service. Vetted stores get my big, gorgeous Concierge book showing off my finest designs. Salespeople — or customers themselves — look through the book and choose the designs they’d like to see in person. I then send those designs to the approved store, the customers make their purchases, and any remaining pieces are returned to me in two weeks. 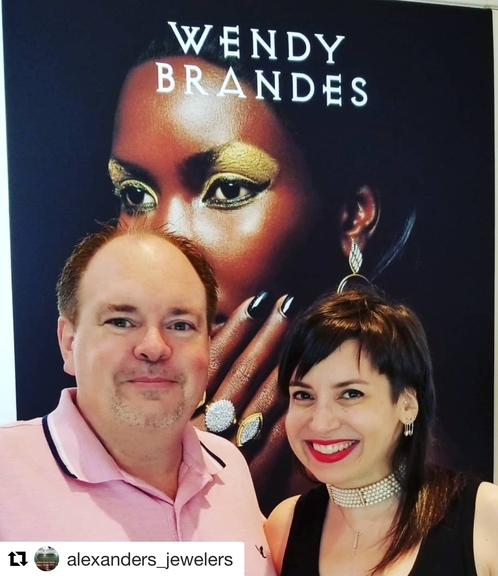 This is a great way for jewelry fanatics outside of New York to try on a range of Wendy Brandes jewelry before they buy. A trusted retailer can request 10, 12, or even 20 pieces for you to consider — and you don’t have to provide your credit-card number until you decide which designs you want to buy and keep forever. Trust me: That’s a shopping experience that no website can offer you, no matter how outstanding its customer service is. 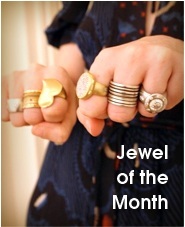 You can read more about my Concierge program in JCK Magazine and National Jeweler. 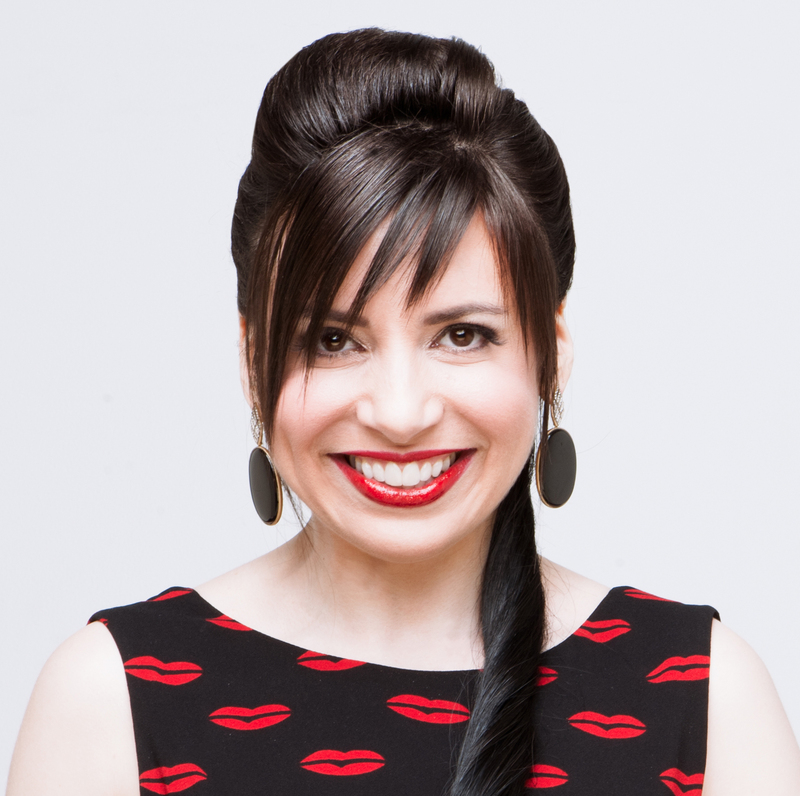 And if you’re spending time in the Hamptons on Long Island this summer, you’ll be able to find my work alongside the other exquisite jewelry designs at Mayfair Rocks — my newest Concierge partner, thanks to Couture!